CW4 Michael L. Wright died June 1, 2006 when his MH-47 Chinook helicopter crashed near Doerun, Ga., during a training flight from his unit's home station at Hunter Army Airfield, Ga., to Fort Rucker, AL. After several years in the U.S. Air Force as a Security Police Officer and an air traffic controller, CW4 Wright was accepted into the Army Warrant Officer Program at Fort Rucker, Ala., in 1989. Upon graduation from the CH-47D Qualification Course in 1991, CW4 Wright was assigned to 2nd Battalion, 158th Aviation, Fort Hood, Texas, as the Production Control Officer. His follow-on assignments included 2nd Bn., 501st Aviation, Camp Humphreys, Korea, as the Maintenance Officer; 2nd Bn., 159th Aviation, Fort Bragg, N.C., as the AVUM Platoon Leader and Maintenance Test pilot; and 4th Bn., 123rd Aviation, Fort Wainwright, Alaska, as the Battalion Maintenance Evaluator and AVUM Platoon Leader. CW4 Wright was assigned to 3rd Battalion, 160th Special Operations Aviation Regiment (Airborne), Hunter Army Airfield, Ga., in October 1999 where he served as the MH-47 Maintenance Platoon Leader, Battalion Production Control Officer and Aviation Maintenance Officer. 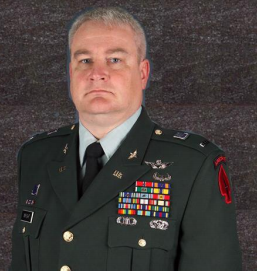 A six-time veteran of the Global War on Terrorism, CW4 Wright deployed four times in support of Operation Enduring Freedom in Afghanistan and twice in support of Operation Iraqi Freedom. His schools include the Air Force Air Traffic Management Course, Air Assault School, the CH-47D Aircraft Maintenance Officer Test Pilot Course, Warrant Officer Basic and Advanced Courses, Survival Escape Resistance and Evasion Course and the Special Operations Training Course. His awards and decorations include two Bronze Star Medals, the Air Medal for Valor, three Army Commendation Medals, the Air Force Commendation Medal, three Army Achievement Medals, three Air Force Outstanding Unit Awards, two Air Force Good Conduct Medals, two National Defense Service Medals, the Armed Forces Expeditionary Medal, Global War on Terrorism Expeditionary Medal, Global War on Terrorism Service Medal, Kuwaiti Defense Service Medal, Army Service Ribbon, Overseas Service Ribbon, and Air Force Training Ribbon, the Senior Army Aviator Badge, the Air Assault Badge, the Air Force Security Police Qualification Badge, Air Force Air Traffic Controller Badge and Army Master Aviator Badge. He was posthumously awarded the Legion of Merit. CW4 Wright is survived by his wife, Judy; his children, Jennifer, Michael, Mallory and Holly; and two sisters, Connie and Vicki Jo.